The picture is as it appears in the photo. The picture goes with my decor and it exceeds my expectations. I love the picture. I've gotten many compliments. 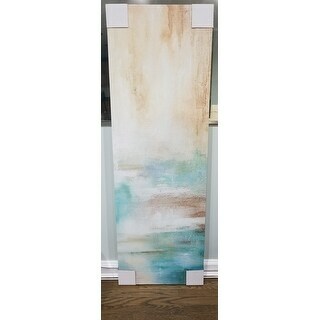 Bring serenity into your home with this 'Misty View II' from Strick & Bolton. The piece is rendered with light blue and gold-beige tones, and features a beautiful impressionist rendering of fog and sunlight. 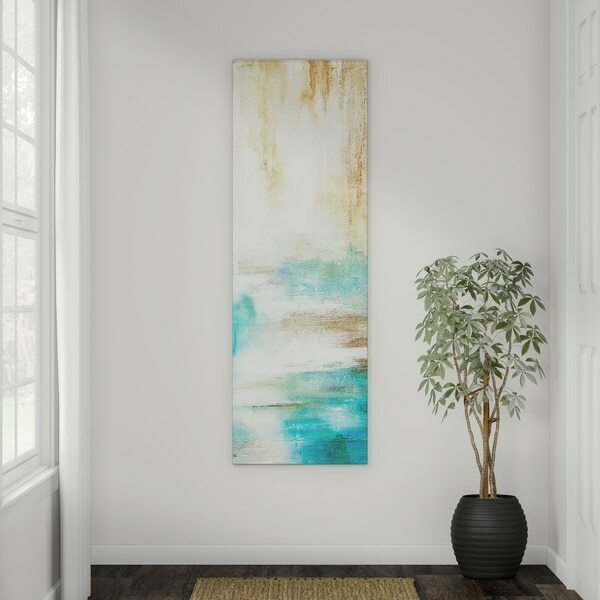 Gallery-wrapped canvas makes this painting ready to hang up as soon as it arrives. I was so nervous about purchasing wall art without seeing it in person. This picture is beautiful. I say picture rather than painting because it's a print on canvas but looks like it's painted on when you step back. I'm really happy I got this. I accidentally left the corner protectors on when taking the picture but you can still get an idea of what it looks like. The colors are exactly as shown in the picture. This is a nice piece. The colors are portrayed accurately online (a nice mix of teal, aqua blue and sand). It worked well in our transitional coastal family room. Exactly as shown on the website. You can choose the size in the options tab.